Our 2017 Allardt Pumpkin Festival King and Queen are Dr. Doug and Gaye Smith. 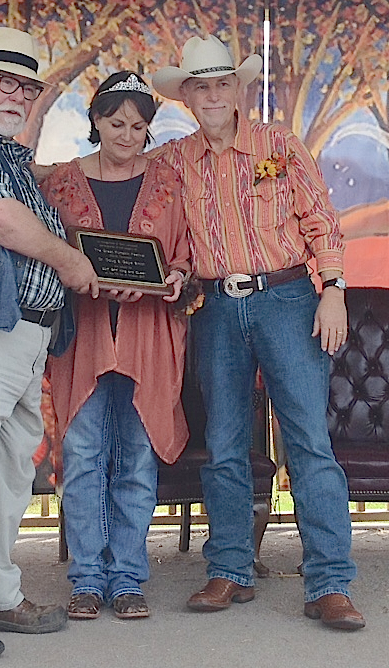 Dr. Doug heads up four successful medical offices, including the Allardt Medical Clinic, and he and Gaye operate Sunset Ridge Cattle Company, a farm located in the south end of Fentress County, where they breed and raise Angus cattle. After graduating from Clarkrange High School in 1969, Dr. Doug attended the University of Tennessee in Knoxville and later medical school at the UT Medical Units in Memphis. Dr. Shelby Turner served as his mentor during his early medical education. The two of them met Dr. Joe Johnson in Memphis. He was then Chancellor of UT’s Medical school in Memphis and had married Dr. Pinckley’s daughter, Patricia. Dr. Johnson encouraged Doug to return to Jamestown when his medical training was complete. Dr. Johnson later became President of the University of Tennessee in Knoxville, and Doug finished his residency at UT Hospital in Knoxville. Doug opened Jamestown Internal Medicine in 1980 and, with his friend and associate, Dr. Rick Clark, to whom he credits much of his success, now also has offices in Clarkrange and Wartburg as well as in Allardt. He credits two loyal and trusted friends, Garry Burks and Laquita Gernt Sandman, with much of the Allardt Medical Clinic’s success. Gaye moved to Jamestown in 1976 and is a 1981 graduate of Alvin C. York Institute. She works in the medical offices and also does bookkeeping and other work at Sunset Ridge Cattle Company farm, where they raise Angus cattle and have annual cattle sales. One of their latest and most rewarding ventures has been providing high quality retail cuts of their farm-raised beef to the community. This year the Smiths sponsored a brand new pumpkin festival event, the first annual Pumpkin Pie and Pumpkin Roll Contest held at the Allardt Medical Clinic, next door to City Hall. First place winners received $200 each. The $10 entry fee went to the Allardt Volunteer Fire Department, and the contest entries were served with meals purchased at the Fire Hall. Dr. Doug and Gaye have been married for 26 years and are blessed with a wonderful family of four children and seven grandchildren, whom they love very much.